There are more folding hardtops today than ever before; the A5 convertible's immediate competitors all employ them. Why is Audi the lone softie? The automaker cites a few reasons: Soft-tops aren't as aesthetically compromising as hardtops, nor do they intrude on trunk and cabin space like a retractable hardtop does. They operate faster. They don't weigh as much, which helps gas mileage and performance. I buy some of those reasons, but not all of them. Cargo volume, at 10.2 cubic feet, is down 1.8 cubic feet versus the A5 coupe's trunk. You'll lose a bit more of that with the convertible top lowered. Audi doesn't report cargo volume with the top down, but the decrease in our test car looked to be about 20 percent or 30 percent. That's far less intrusion than the folding tops in the BMW 3 Series, G37 and Lexus IS convertibles, which take up a clear majority of trunk space when they're down. Consider: The Volvo C70's hardtop is one of the least intrusive of its kind, and it takes up 53 percent of the trunk. Folding hardtops aren't small contraptions, and they have to go somewhere. It took our test car's power top 17 seconds to lower and 19 seconds to raise, and there's no fiddling with latches or levers required to bookend the process. That's a few seconds quicker than Lexus and BMW — and much faster than Infiniti and Volvo, whose slowpoke tops each require about 30 seconds to do their thing. Another bonus: Audi's top operates at speeds up to 30 mph. Most folding hardtops we've tested call it quits if you start moving at all. It's usually for good reason — to avoid hardware damage and discourage distracted driving. But get a few honks at a green light while you wait for the top to finish its thing, and you'll wish it could at least do so while you were starting off. 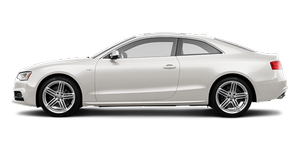 Thanks to having the group's only four-cylinder engine, the all-wheel-drive A5's EPA-estimated city/highway combined rating comes to 23 mpg. The rating applies to both the coupe and convertible — one possible result of the droptop weighing only some 350 pounds more than an A5 coupe with an identical drivetrain. The turbo motor can also use regular-grade fuel, though Audi recommends premium for the best performance. The G37, IS 250C and 328i all require premium; the C70 is the only one that recommends regular. What I don't buy are Audi's aesthetic reasons for keeping the soft-top. The A5 looks sharp with the top up or down, but that's mostly because its coupe sibling is so well done. Some A5 competitors look odd — the IS convertible, in particular, has a ruinously proportioned tail — but a fundamental benefit of the hardtop convertible has always been that it can retain the lines of a coupe. Some, like the BMW 3 Series convertible, do this better than others. Another soft-top deficit is wind noise with the top up. The A5 keeps it low — road noise is low, too — but the wind begins to creep up around 70 mph or so. Hardtop convertibles generally do a better job of insulating against noise, so if you're shopping the competition, make sure to log some highway miles on your test drives.